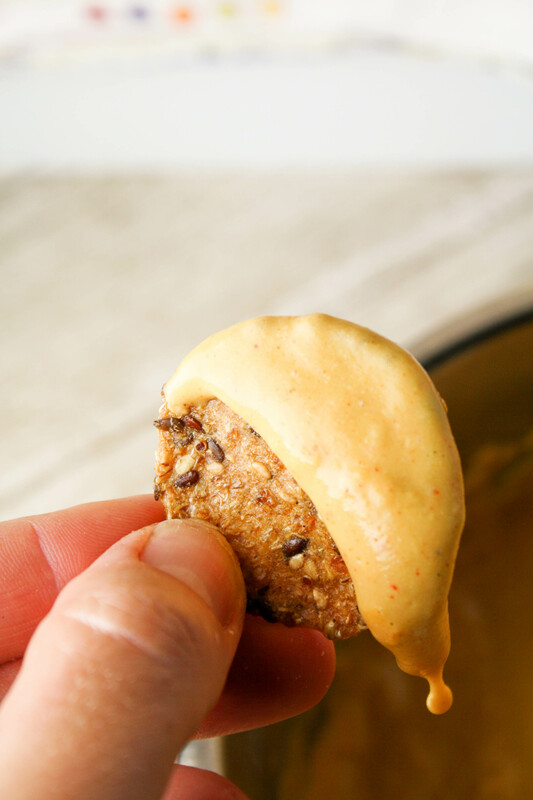 A vegan nacho cheese sauce made with real food ingredients and ready to slather atop for favorite chips and veggies! Real food hot nacho cheese sauce with no junk! A dairy free dip that will have you wanting more….even if you CAN have dairy! A couple of times in her short life, my daughter had the ‘pleasure’ of partaking in one this country’s nastiest creations: powdered, fake nacho cheese sauce. I tried to explain how it was made and why it was something that was not good for our bodies (while she scarfed said nastiness into her gullet), however…..she seemed totally unconvinced. “But Mom!! It is really good!” she lamented! Sigh. I remember how much I too enjoyed those sauces growing up, Eazy-Cheese was one of my favorites (gross!)!! But now…..we know more. And I know better. MAYBE it was time for me to recreate that flavor using ingredients I could pronounce?! I never have lofty hopes when trying to make dairy free cheese sauces. I have made more than I can shake a stick at. None of them convince anyone in the family. But this one did. I adapted this recipe from a lonely copied recipe that I have had in my ‘to try’ folder for some time. There is no book name or author on the page, so let me know if this looks familiar! My daughter thinks I make this special hot cheese sauce just for her. She doesn’t know or care that it comes from all wholesome, real -food ingredients! She doesn’t care it’s a dairy free cheese sauce. She just likes it, plain and simple! Kids are simple like that. And no, it does not taste like REAL cheese…it tastes like that hot nacho ‘cheese’ sauce that lives in proliferation in concession stands across the US! And one day, I can hope, that she too will learn that what food she puts into her body really does matter. Until then, I present you with a dynamo dairy free cheese sauce worth making over and over! 1 1/2 teaspoons smoked paprika reduce if you don't like a smoky flavor, but it is a key flavor here! In a blender, puree all the ingredients through the seasonings until smooth and no gritty texture left from the nuts. I did this for one smoothie cycle in my Blend Tec. Pour into a small saucepan, and gently heat over medium low heat, whisking frequently. When the sauce is thick and creamy, remove from the heat, and stir in the butter and rice vinegar. Store in an airtight container. I enjoyed this first batch very much. I look forward to making again when I have all the proper ingredients including smoky paprika and hungarian paprika. I presoaked my cashews the night before. I enjoyed dipping crackers in it (JILZ paleo crackers are really good). I also reheated some in a saucepan and and stirred in just-cooked GF pasta for a yummy homemade GF DF “mac and cheese.” There was still some left, so I poured it in a mason jar and stuck it in the freezer … I’ll let y’all know how it comes out! Would like to use later over roasted broccoli or maybe for a junk food session, I’ll use it with some corn chips for GF nachos (assuming it defrosts well). I miss cheese SO much, but having a creamy, savory sauce like this really helps! Thank you, Tessa! OMG, wait until try it with the smoked paprika!! they sell it at Trader Joes, fyi. So glad it is still hitting the spot Lindsey! Blend all ingredients (except lemon juice) until very smooth. Place in saucepan and bring to a boil while stirring. Add lemon juice at the end and mix in thoroughly. Thanks sarah, I appreciate you sharing your version too! Thanks Anni, I appreciate your feedback! My husband would be so glad to see this! He recently cut dairy out of his diet (hopefully temporarily! ), and he misses cheese. Thanks for sharing with Waste Not Want Not Wednesday! I can’t wait to try it as soon as I get the ingredients! This sounds like heaven….only catch were the cashews. I did definitely perk up with the mention that soaked sunflower seeds would work too, but can’t figure out how much should be added in replacement to the 1/2 cup of cashews? Would I need more sunflower seeds instead of 1/2 a cup? Hey Tessa (heehee!) should be roughly equal amount, perhaps a couple tablespoons extra! I have been thinking lately that hemp hearts might be another good alternative! Seeing how I love cheese, but it don’t love me this could be an alternative for me. Pinned to my healthy eating board, would love for you to share on Real Food Fridays. This sounds wonderful…but what can I use instead of the nutritional yeast. I can’t tolerate it. I have tried to find something else but without it, the flavor is bland. Your Nacho Cheese Sauce sounds terrific. 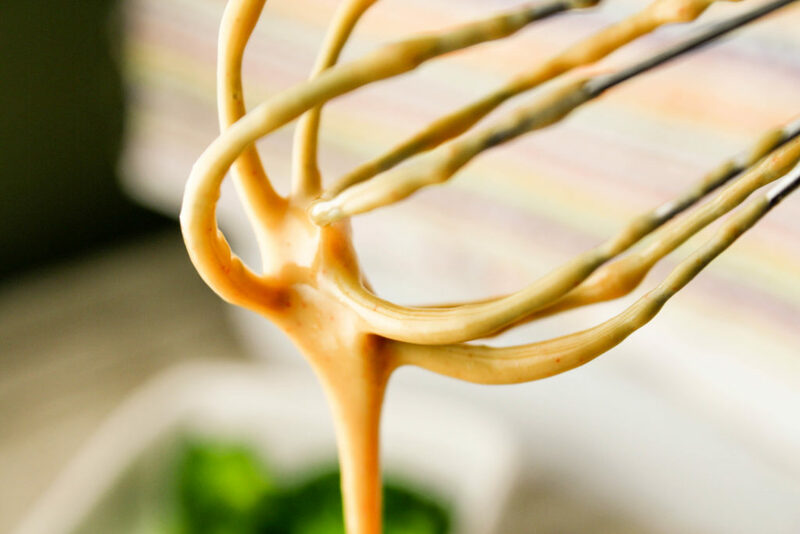 I know it can be hard to make cheese sauces dairy free but you’ve done a fantastic job here – even the texture coming off the whisk looks perfect! I like the spices you have used too. Mmmm, I love dairy-free cheese! And I love how oozy yours looks. Bet it would be delicious over cauliflower, apple slices, and tortilla chips! Well done!!! Anything that you can use in place of the nutritional yeast? My son has yeast sensitivity. I was just saying we needed a more grain free dairy free yeast sauce!! Yippee! wohoo!! Hope you like Adrienne! This looks terrific! I make a vegan cheese sauce but never exactly like this- I like the ingredients in this- I think I’m going to try this one out! Thanks for sharing! 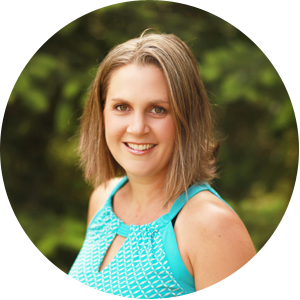 Tessa – this sounds delicious! A great option for those that are dairy free! Thank you Ina…did you get the linky issue figured out? Would hate to not see your delicious recipes on AFW! I can’t wait to give this a try! My lactose intolerant son loves nacho cheese sauce and I have been looking for a substitute. Let us know how it turn out for you Alea or any fun changes you make! This looks so tasty. 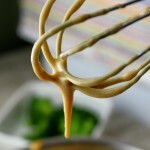 I am all about “cheese” sauces-can’t wait to make this! Thanks Tessa! You had me at Nacho Cheese and then DF!! I would have to use sunflower seeds, as both of my kids are allergic to nuts but am excited to find this for my son who is also allergic to dairy. My son can’t do nuts either, I have been experimenting A LOT lately with sunflower seeds and bet these would be delicious in this, thanks for your comment AMber! My dairy free 5yo would love this! Hopefully they do Wendy! I know mine does!! Looks great Tessa!!! 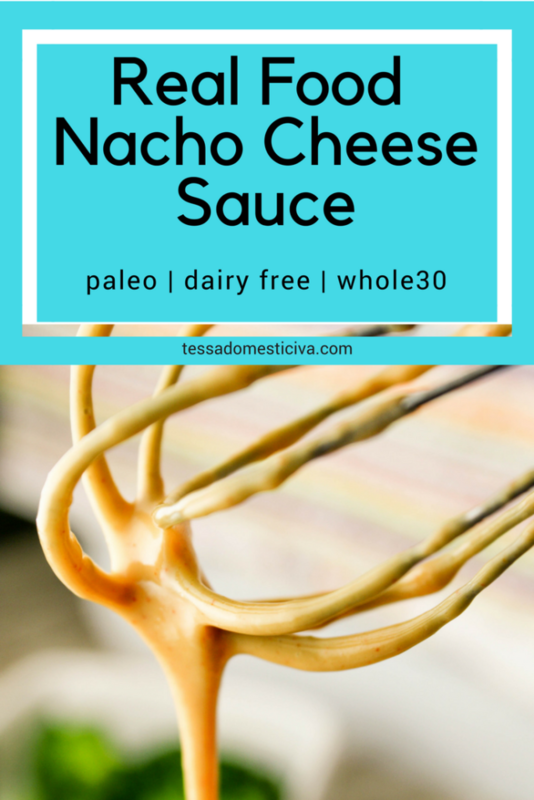 I make a similar “cheese” sauce, but I LOVE the idea of serving it has a nacho cheese sauce. So cleaver. I’m trying my best to keep up with all the posts each day! So much good information and awesome recipes. It may take a while to digest everything. But what you’ve shared thus far has been stellar. Great job friend! Yay! You finally posted it! Do the cashews need to be pre-soaked? ‘if you have a really weak blender, it wouldn’t hurt, but no, you shouldn’t have to soak them.